The members of our gallery are made up of many uniquely talented Artisans who not only provide the gallery with many forms of arts & crafts, but many give of their time too. All our Artisans give 10% of their earnings to the local charity by way of committee approval. Learn more about each Artisan and their craft in the bios below. Suzan loves to bring new life to old things. Most of my jewelry is made with semi-precious stones, but she would never worry about mixing them with less expensive materials. This approach has allowed her to create pieces that are one of a kind and won't go out of style. She also alters art, furniture, lampshades and other items that might otherwise be tossed away. For her, an object is most interesting if it comes with a little history. 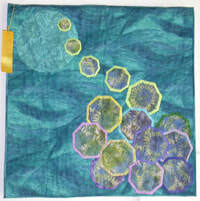 Rebecca has always loved functional art, fabric, patterns and color. 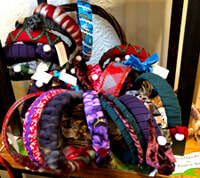 Her headbands, barrettes and clips are made with any combination of soft fabrics: velvet, flannel, jersey; beads, yarn and other cool finds. Rebecca is passionate about repurposing materials, as the environment and land conservation have long been central themes for her. She has an Etsy presence and hopes to bring joy to those who wear her art. In her spare time, Rebecca loves taking her daughters and dogs on adventures, big and small. D'Ann was inspired by a neighbor when they painted acrylic floor cloths together. She took classes in a variety of places and discovered that watercolor works better for her than acrylic. She loves the way the colors blend on the paper. She is a birder and general nature enthusiast which is reflected in her work. D'Ann teaches watercolor at the Lexington Arts and Crafts Society where she is a member. She is also a member of the Concord Art Association and the North Shore Arts Association. D'Ann earned the 2009 Charlotte and Alfred Movali award at the North Shore Arts Assoc. for one of her watercolors. Tarja enjoys the process of weaving and the unique textures that it creates and that choosing and mixing colors is the fun part of her work. She makes use of dyes, paints and threads to achieve her subtle color palette. 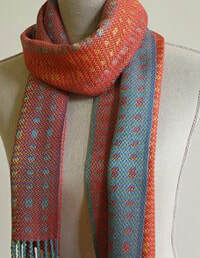 She works with different textile mediums, which she applies to her art and functional accessories. Her studio is located at Western Avenue Studios in Lowell. Vito feels walking is a form of exercise that allows the participant to fully enjoy his or her surroundings. It only requires appropriate clothing for the climate, a good pair of shoes, and of course a good walking stick to guide you in your journey. Vito gathers limbs from Mother Nature... typically hardwood including oak, maple, ash and beechnut. His walking sticks vary in length from 32" to 39.5" (custom by request). The tips are made with brass or copper and finishes of quality stain or varnish... no two are alike. Vito also builds a variety of furniture, not currently shown in the gallery, but enjoys working with wood in many forms. 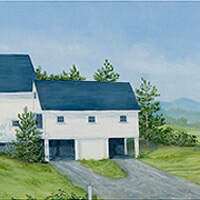 Laurie has always found a visual treasure in the rural landscape of New England and the Northeast. She cannot remember a time when she did not want to capture in paint the essence of a rare day in June, or the history reflected in a weathered barn. Recording these images allows her to refocus on the simple pleasure of being aware of the light, color or quiet, at a particular moment in a particular place. Her only goal in painting is to bring joy to the viewer. Gail is a painter, illustrator, and freelance graphic designer with a studio in Carlisle. Her paintings explore her particular fascination with rural and suburban scenes where human activity and the natural world are juxtaposed. For over twelve years Gail has been the owner of Live Event Paintings. She creates heirloom works of art on location at celebrations including weddings, bar/batmitzvahs and fundraising events. Gail teaches painting and drawing privately at her studio in Carlisle. 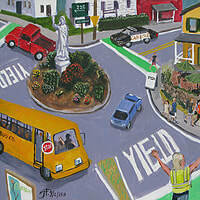 She is currently working on a series of paintings called “Town Centers of New England”. Primarily working with cotton and wool, Nancy has been sewing all her life and has always loved fabric and color and the different shapes of things. She never thought of quilting until almost 20 years ago, when a sales associate in the fabric shop asked her what she was going to make, she answered, "A dress", the woman laughed and replied, "You should try quilting. You"ll never go back." She was right. 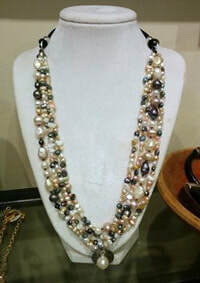 Rebecca has been designing and creating her artisan handcrafted jewelry for over 25 years. Her interest in metalsmithing began as a hobby during high school and she advanced her skills working as a jeweler’s apprentice for summer employment throughout her college years. Using traditional tools and fabrication techniques, Rebecca meticulously handcrafts each piece from sterling silver and gold sheet and wire. Her designs often showcase unique gemstones and colorful sea glass. The ever-changing colors, shapes and textures of nature surrounding her rural New England home provide a wealth of inspiration for her designs. Rebecca has been a juried member of the League of NH Craftsmen since 1997. Her porcelain pieces are influenced by the technique of 18th Century Meissen, European porcelain. Each collectable is hand-built and hand-painted. Once formed, each hard paste porcelain object is fired 5-7 times in a kiln, then brought to life with the finest of enamel colors. She loves making things from nature and enjoys to hike, read and travel. ​Priscilla's work is inspired by the late 19th century pointillists such as George Seurat and Paul Signac. Seurat invented the technique of pointillism, which means painting with tiny dots which merge into a hazy color when seen at a distance. He called this effect "optical mixing". 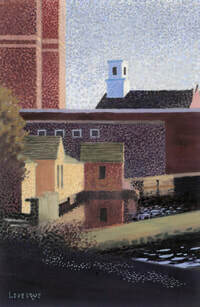 Casein is an ideal medium for pointillism because it is thick and opaque and dries quickly. She usually applies multiple layers of dots in order to achieve the best color effect. Her paintings are small because the work is time-consuming. Priscilla has a studio at Western Ave. in Lowell. Barbara can find joy in transforming fabulous fabrics into handy everyday things that provide pleasure through beauty and function. Most of her products are made from what she refers to as rescue fabrics - pieces that others are delighted to find a good home and purpose for. Purses, tote bags, card holders, wine and gift bags and more. These designs are unique and she also enjoys working with customers to create custom pieces that will turn their vision into a reality. 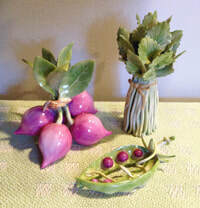 Melinda loves to work with clay to feel its movement and develop new forms on the wheel or by forming it with her hands. She especially loves to make large vessels and unique shapes. Recently she has been experimenting with large hand-built sculptures, bells and garden ornaments, as well as smaller delicate pieces as serving ware. Glazes bring the finished pieces to life, and recent work includes both green and gold glazes for the sculptures, and lighter multi-patterned glazes for the serving ware. Melinda has worked in ceramics for over 40 years, specializing in high fired clays and glazes that she forms into serving and dinner ware with multi-patterned glazes, along with large sculptures and garden bells. She works from her studio in Carlisle and at the Umbrella for the Arts in Concord, Massachusetts. You can see examples of her work at www.melindalindquist.weebly.com. Teri has a passion for taking digital images. You can often find her with a camera in her hand at family events and wouldn't travel anywhere without it. Working with flowers (dried and silk) is another one of her hobbies and working with recycled materials that can be repurposed. There were many ideas that she tossed around and finally found a way to combine those passions into a mixed media art form. She is very exciting to start implementing the projects with the many materials collected waiting to be reused, renewed and recycled. Chris has always been somewhat of an artist, painting with watercolors, knitting and sewing. Her love of jewelry from around the world inspired her to give it a go. She started with beading, taking guidance from a Massai friend in Tanzania. Upon seeing the metal forming in the Southwest, Laos, Vietnam and South America, she decided to switch focus and learn how to shape metal to create statement pieces that would wear every day. In addition to the Carlisle Artisans Gallery, her pieces are displayed at the Clever Hand Gallery in Wellesley, the Artful Heart Gallery in Arlington and the Karenna Majai Gallery in Belmont. Ann recently moved to Massachusetts from Ohio. She holds a BFA from Cleveland Institute of Art and studied with Elmer Bischoff at UC Berkeley. Ann has participated in numerous shows and has won many awards most recently a jurors award at the 2019 Concord Art Association Juried Show. I think you will agree her still life takes on a life of their own. Born in Milton, and educated at Yale University, she escaped to the west coast for 10 years of new experiences in the 70's. She worked as a designer and photographer for the Small Farmer's Journal, played softball and soccer, and continued to pursue her passion for photography which began when she was 16. At 30, she went to graduate school for an MFA at Ohio University. Gradually as a husband, two children and three dogs entered her life she continued to photograph and also teach photography at several schools. She has been a member of the Umbrella Community Arts Center for 26 years. 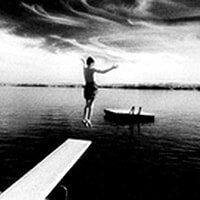 She is the photographer for the Concord Art Association, teaches at the Middlesex Summer Arts Camp, and continues to photograph herself, her family, and her life. Alexander offers marvelous elixirs, tonics, tinctures, syrups, salves, balms, and essences. A carefully chosen selection of plant centric commodities formulated with Organic, Biodynamic, Spagyric, and Ethically wildcrafted practices. Dynamic combinations of Roses, Elderberries, Mushrooms, Maple Syrup, Honey, Herbs n' Roots. Alexander also enjoys being a disc jockey, with a passion for nearly all forms of music. Bill has always been somewhat of an artist as he used art in his teaching as an educator and biologist at two-area private school. In his recent retirement, he has been able to devote time to painting classes and showing his art. 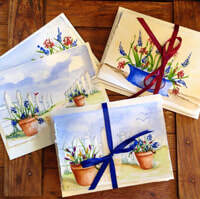 With his love of making watercolor paintings from inspirations from natural areas and rural views, his interest seems to have focused on notecards where each notecard is individually hand painted with seasonal themes. 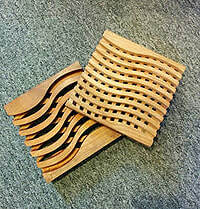 ​David enjoys making trivets from 5 1/2 square inches of solid wood. They can be used in a variety of ways, and also as a piece of art. Are you interested in becoming a Member of the Carlisle Artisans? You can find out more about becoming a guest artisan on our agreement page, you can find our application there. If you have questions or just want to chat with us you can contact us at carlisleartisans@gmail.com . If you are submitting an application, please email or bring it in person as we visit our post office box infrequently. Thanks!